Please find us at the show, mention the blog and get 15% off. Rain or shine. Free admission for fathers on Father’s Day, June 17th. Hours : 10 a.m. to 5 p.m.
View the Programs Schedule. Screen shot the map to your phone, click here. At Olde Good Things, we strive to preserve pieces of architectural history as a whole or use those pieces to create something one of a kind and handmade in our Scranton, Pennsylvania shop. 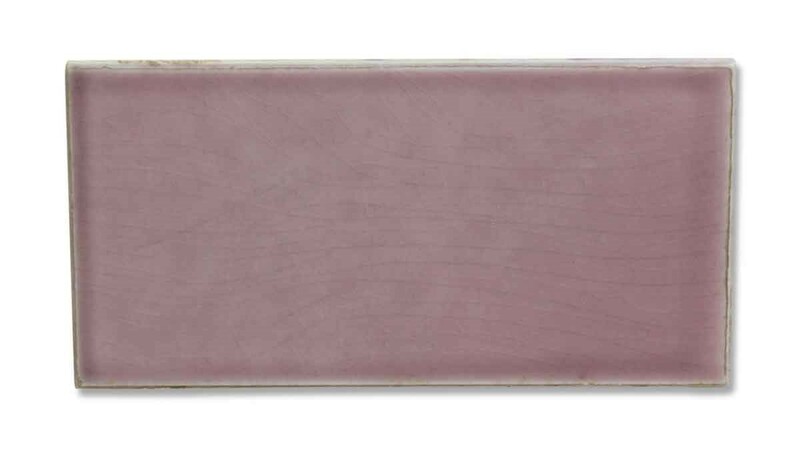 Some of our more unique products are our tin ceiling panels and mirrors. 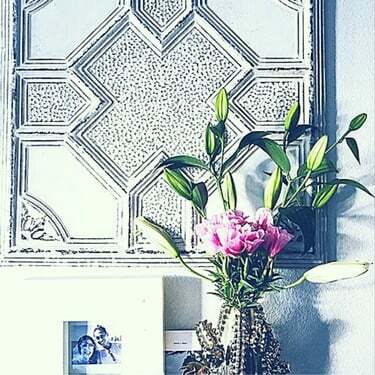 What makes these tin mirrors and panels so unique is that they are made from 100-year-old tin ceilings that we have salvaged from historic buildings across the United States. 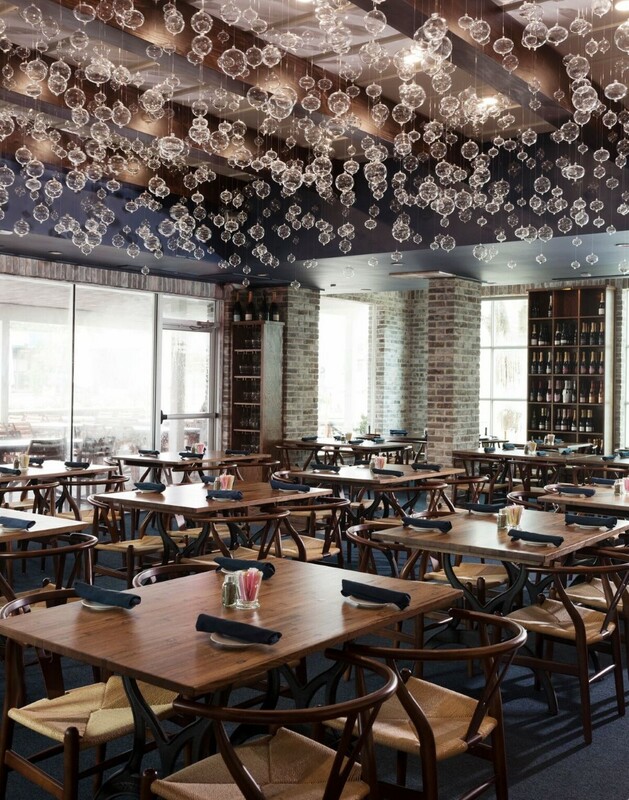 Tin ceiling was a result of American ingenuity and innovation in the mid-1800’s, as well as a direct response to decorative plaster ceilings that were in style in wealthier European homes. Tin ceilings were a better design choice than a plaster ceiling, as it retained the beautiful architectural design of a plaster ceiling while being much easier to install. In the late 1800’s, the production of tin ceiling peaked as Americans sought out beautiful interior design ideas, with roughly 45 companies in the US producing tin ceiling pieces. To salvage these architectural artifacts, Olde Good Things purchases the tin ceilings while they are still in their original old buildings. We then reclaim these pieces ourselves by prying out the nails that hold the tin to the wood strips on the ceiling. The next stop is our Scranton workshop where the pieces are cut to size, attached to a wood frame, finished with a pop of color and sealant, and finally a piece of mirror is installed to complete the process. We give these mirrors and panels new life, helping to preserve their history while creating a functional and unique antique furnishing for your home. 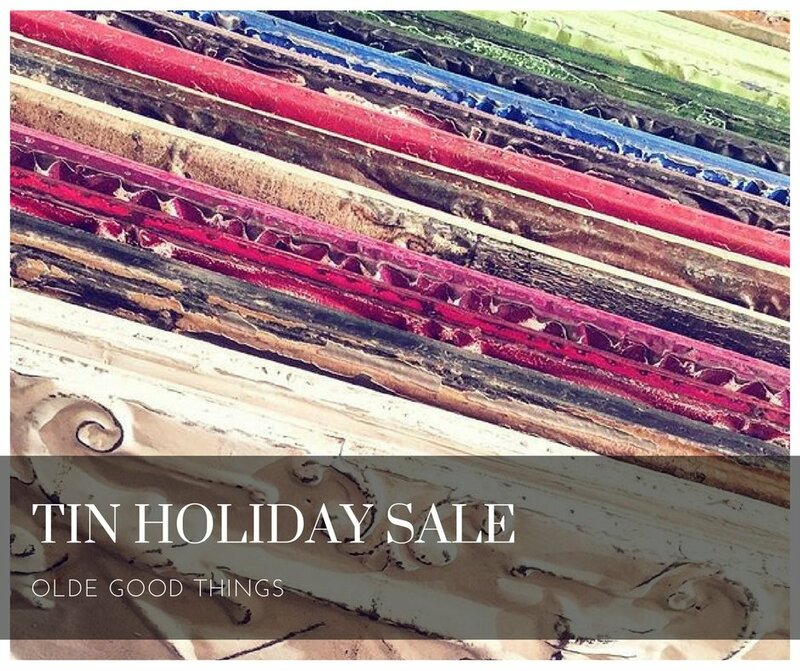 Our reclaimed tin ceiling panels and mirrors make great gifts for those loved ones on your holiday shopping list. 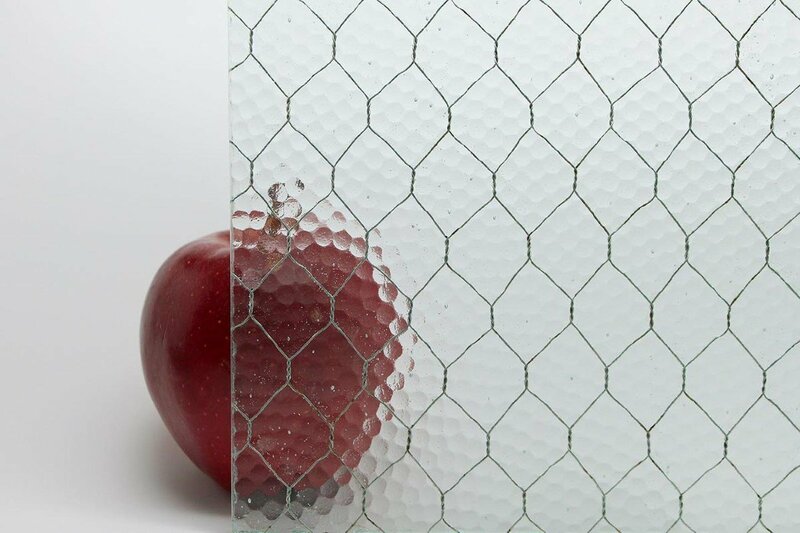 As a special for the holiday season, we’re offering three different promotions for our tin mirrors and panels. Be sure to order soon so you can get them for the holidays. We’re sure they’ll make an exceptional addition to any home. 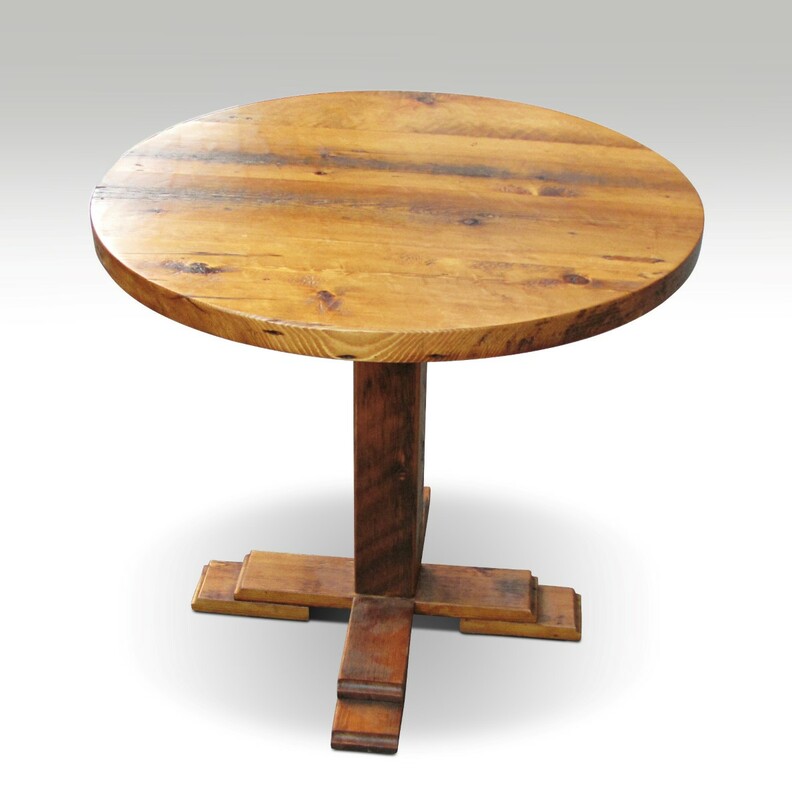 For more information or to see our wide variety of reclaimed architectural antiques, visit our webstore at ogtstore.com. 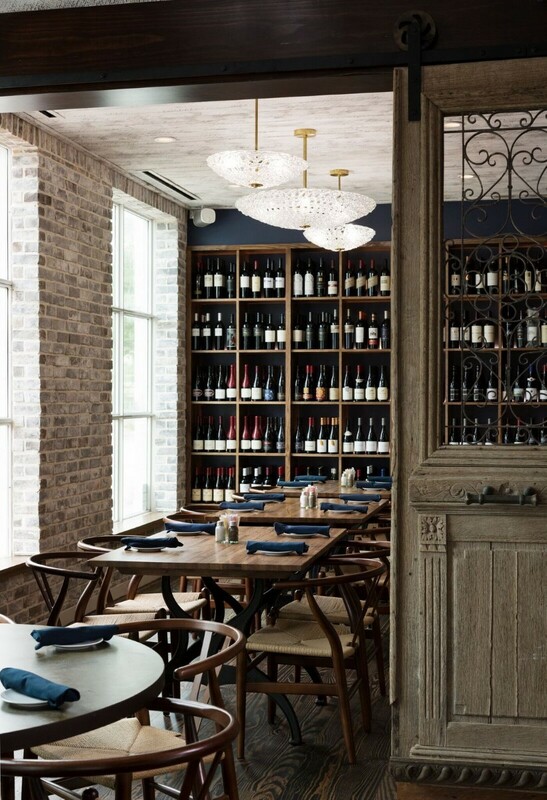 When restaurateur Shawn Virene proposed his first solo endeavor, a’Bouzy, he had a very particular vision in mind; a culinary haven where fine wines and great food have an equal place at the table. 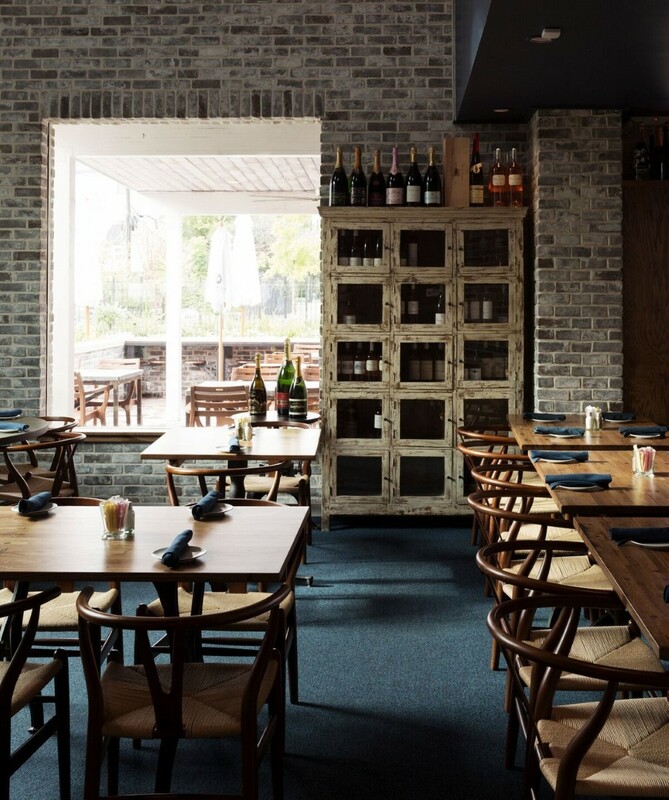 a’Bouzy, named after the French village Bouzy located in the heart of the Champagne region, features an effervescent and coastal Mediterranean ambience echoing the namesake’s region throughout with an open layout, exposed brick and reclaimed wood. 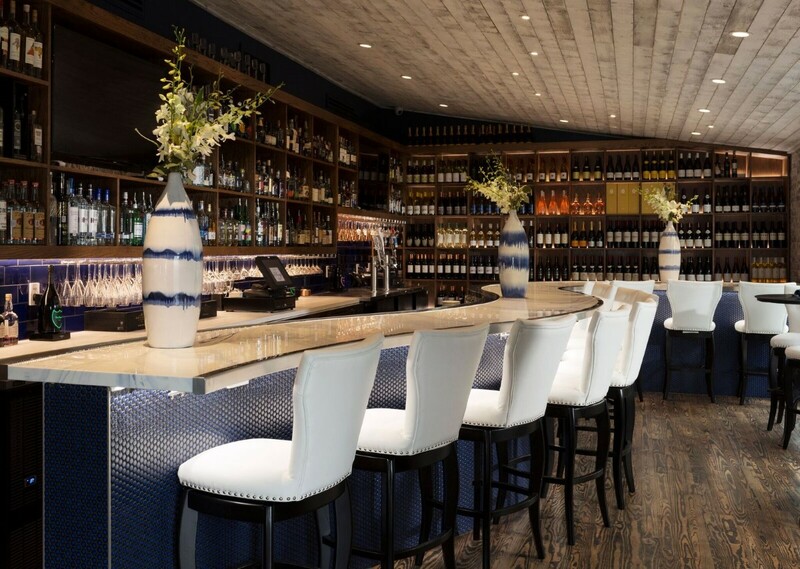 Olde Good Things had the pleasure of working with Shawn and his team during the design process, in the hopes of bringing a mix of both modern and antique touches to round out his ideas for the space. 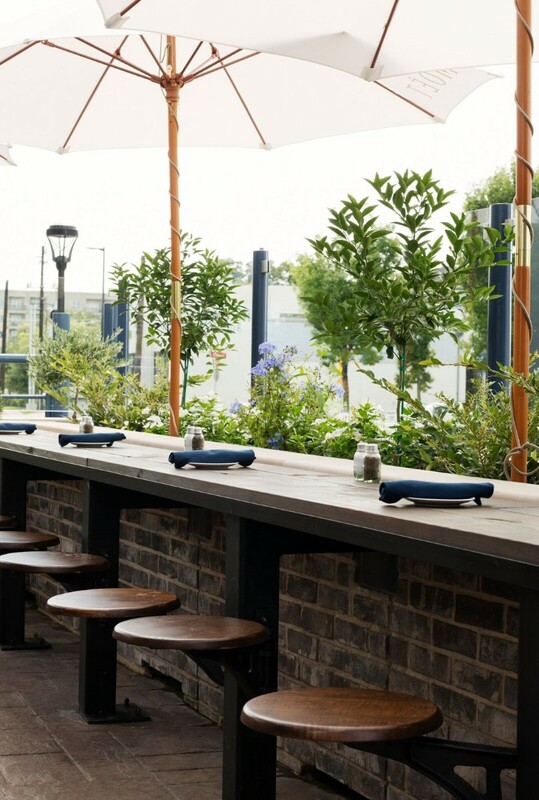 To help maximize seating capacity without sacrificing space, Olde Good Things recommended our custom-built industrial wood top swing seats in the bar and in the outdoor seating areas. 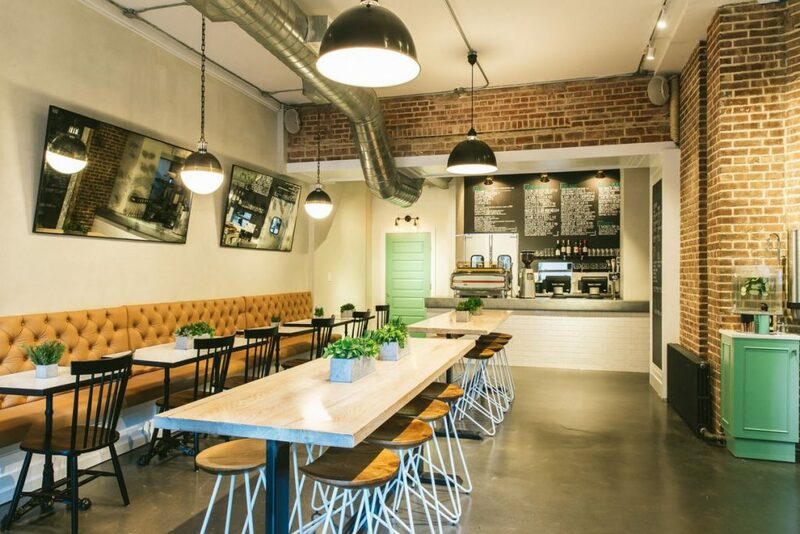 These seats provide a classic industrial look with modern accents. 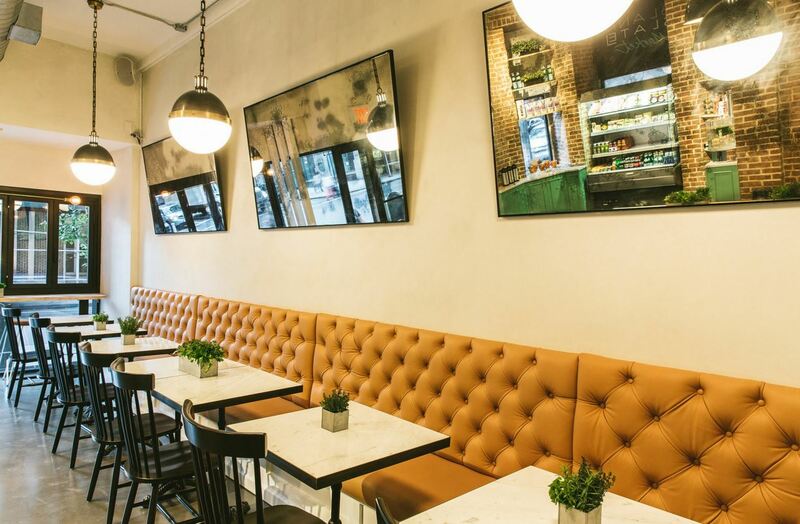 As a counter to this modern seating solution, we suggested a set of 3 antique blown glass lattice pendant lights to help anchor the space. 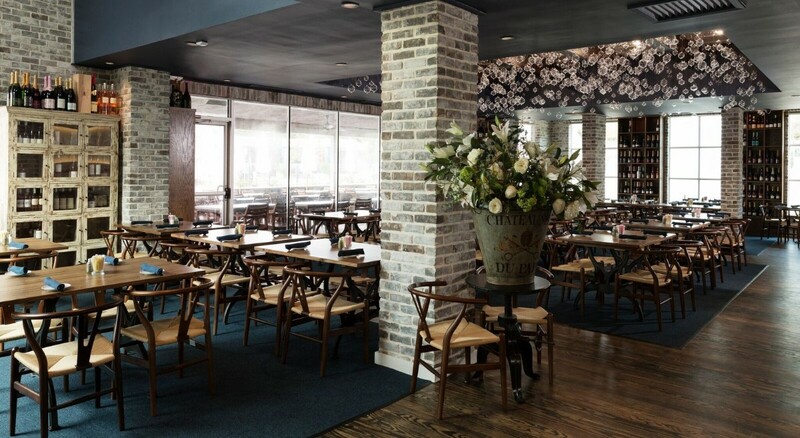 Throughout the dining room, Shawn and his team chose to use our Altered Antiques industrial wood flooring topped tables paired with Brooklyn cast iron legs to add a worn-in vintage feel. 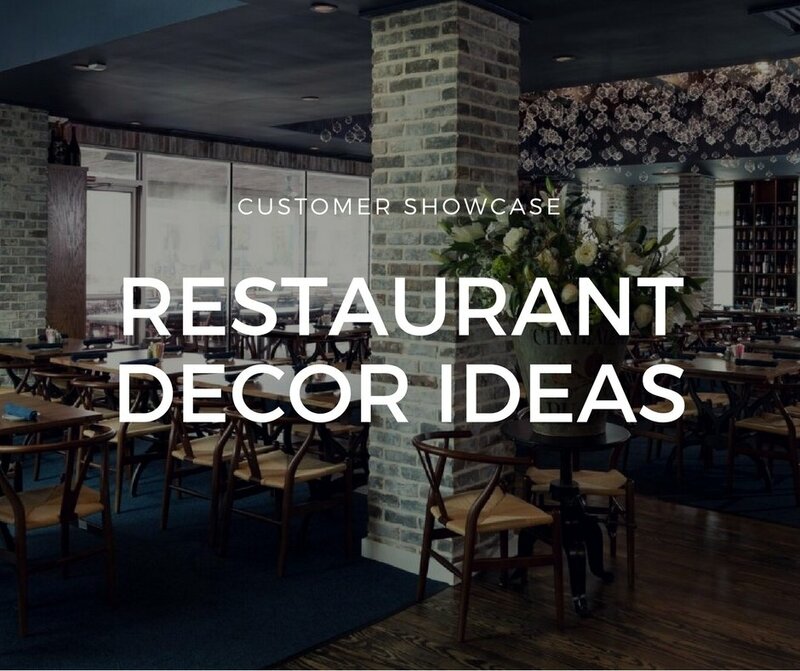 At Olde Good Things, we enjoy working with restaurateurs and designers to help bring their ideas to life. 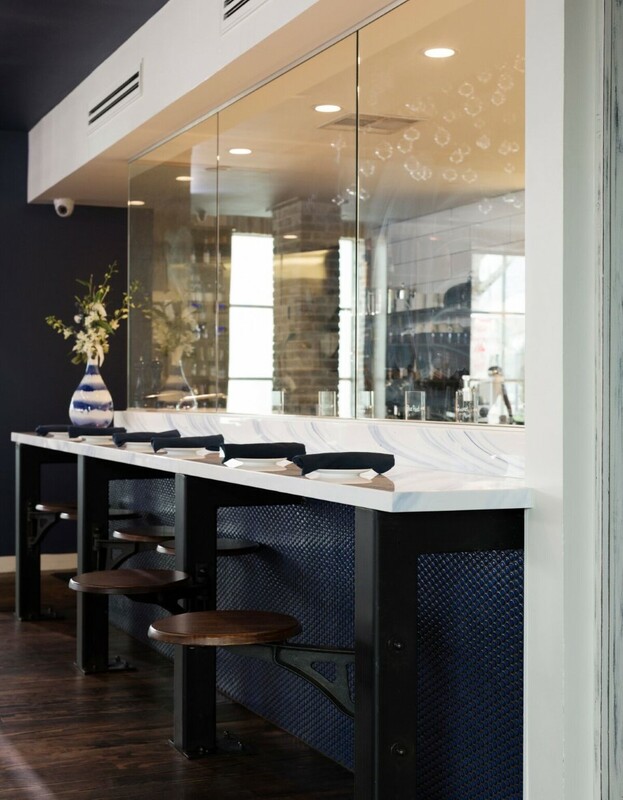 We offer a wide variety of both custom-built and salvaged antique products to suit any need as well as providing special pricing for the restaurant industry. 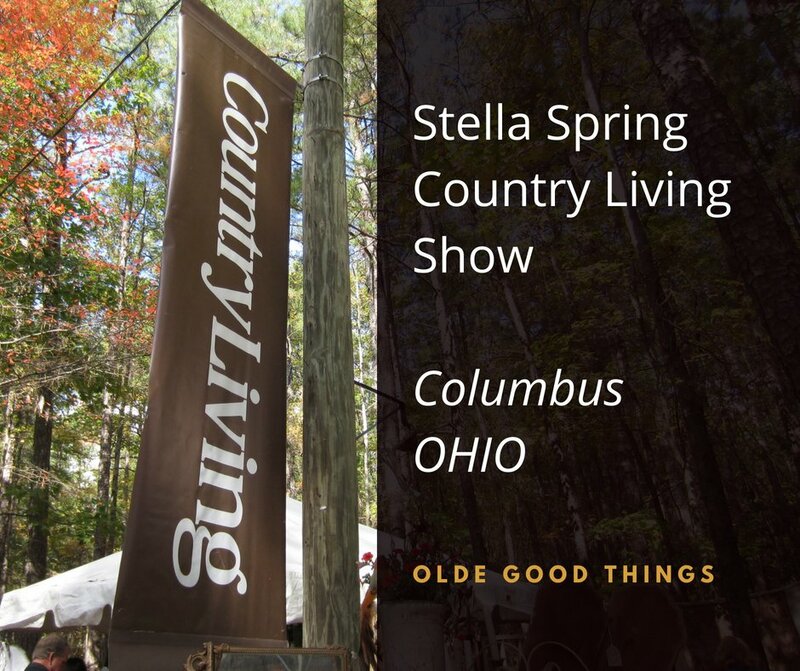 So, whether you’re looking to add elements of industrial, rustic, modern, or vintage, Olde Good Things has something for every design aesthetic. Farmhouse style rustic is one of the most popular design trends sweeping the globe. Not only is the use of wood and metal an edgy look, it can provide the ideal balance between modern and cozy in the chemistry of your home. Designing your kitchen with Farmhouse design elements is easy, and it will give the room a unique balance between cutting edge and traditional. Distressed finishes highlight this look; sleek distressed wall wood skins and timeless distressed furniture complement each other. Pair with vintage white subway tile and antique tin mirrors, wood and metal baskets, and chicken wire glass on the cabinet doors for a finished and perfected rustic kitchen and dining room. 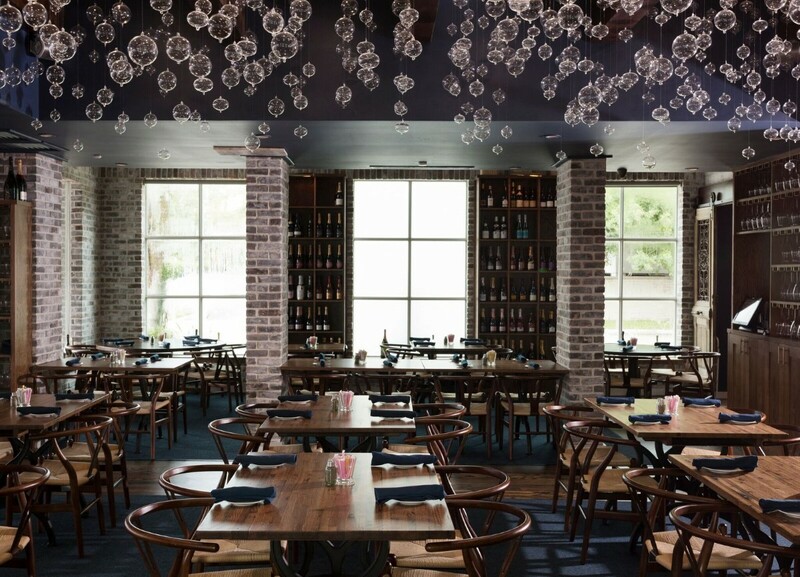 Other design elements to consider are iron hooks on planks to hang utensils, coats, or even antique light fixtures. 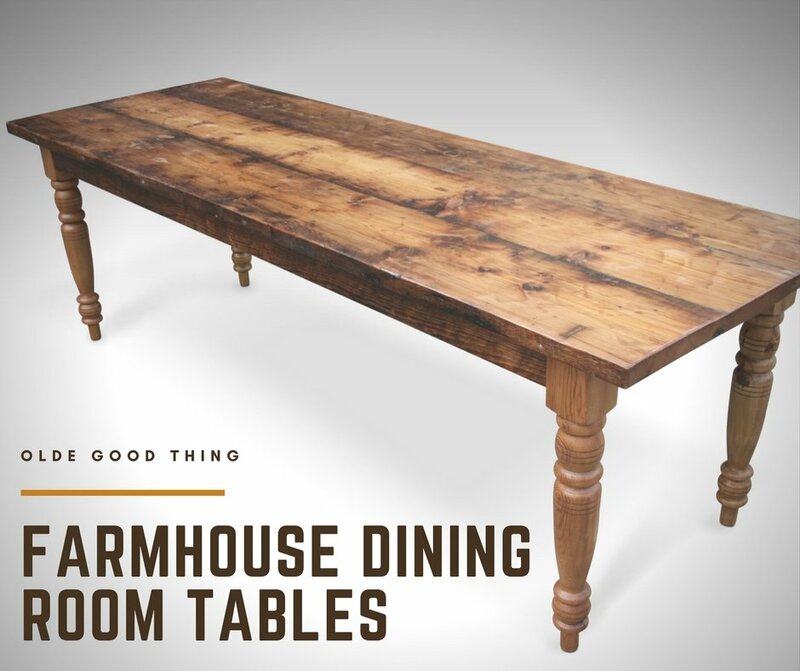 Farmhouse style dining tables, in particular, are one way to bring this contemporary vibe into your space while inventing a traditional place to create years of memories. 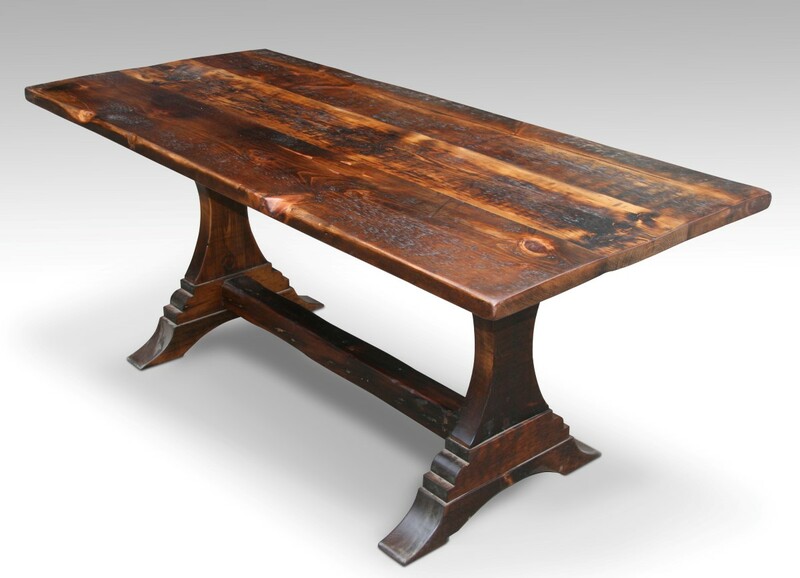 The artisans at Olde Good Things have perfected the art of the farmhouse dining table. 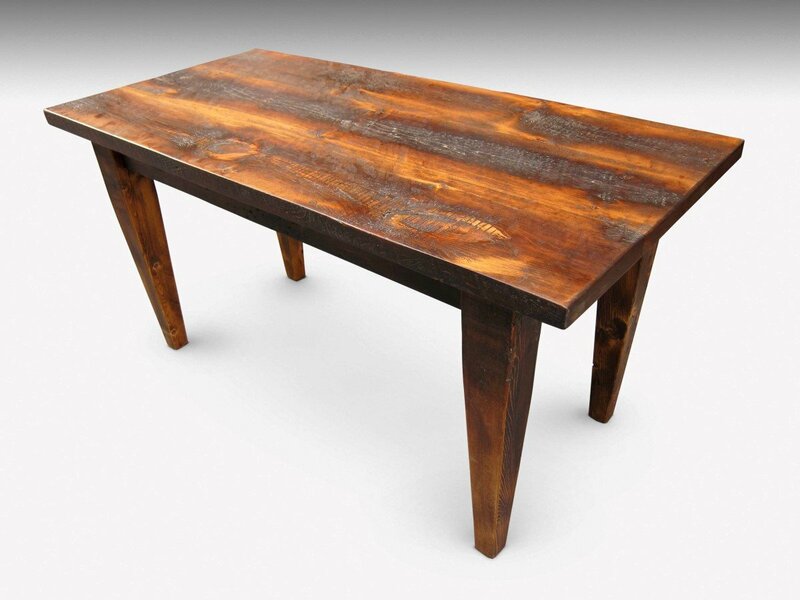 Like our other crafted items, the dining room tables are made from reclaimed materials, often from buildings over a century old that would otherwise end up clogging up the landfill. Custom salvaged wood from classic buildings is actually of a far better quality than the pressed fabricated wood used in new furniture. 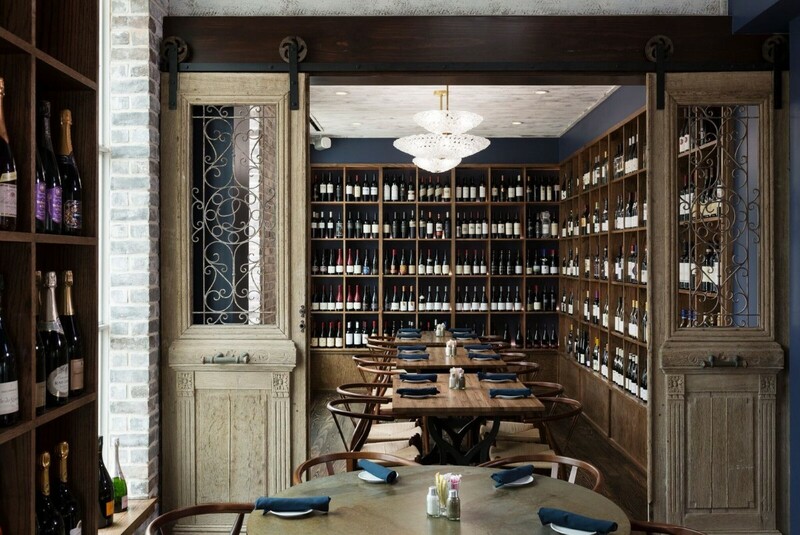 When choosing pieces of reclaimed wood from historic brownstones and famous buildings, our architecturologists select only the best reclaimed wood from the beams and joists. Then we send the specially selected wood to our warehouse in Scranton, where our craftsmen begin to sculpt and shape the dining room tables. You can learn more about our custom process here. 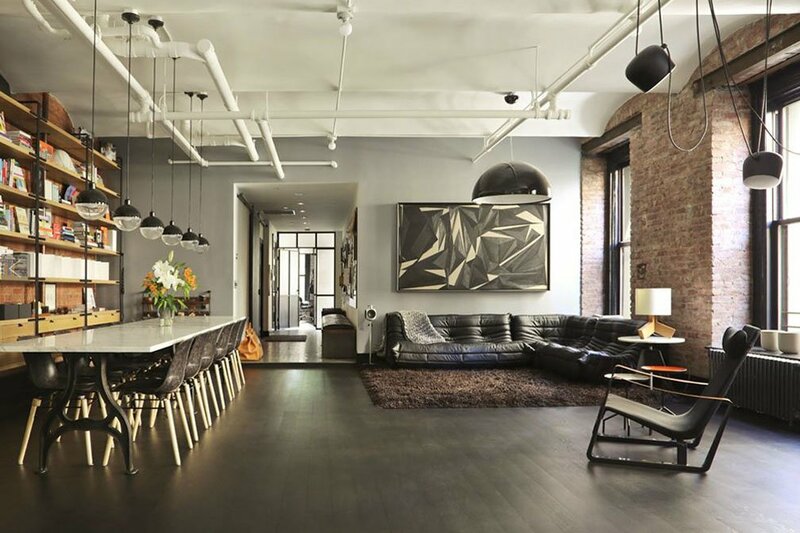 If you have decided to go with this stunning look, measure your space and record the dimensions. 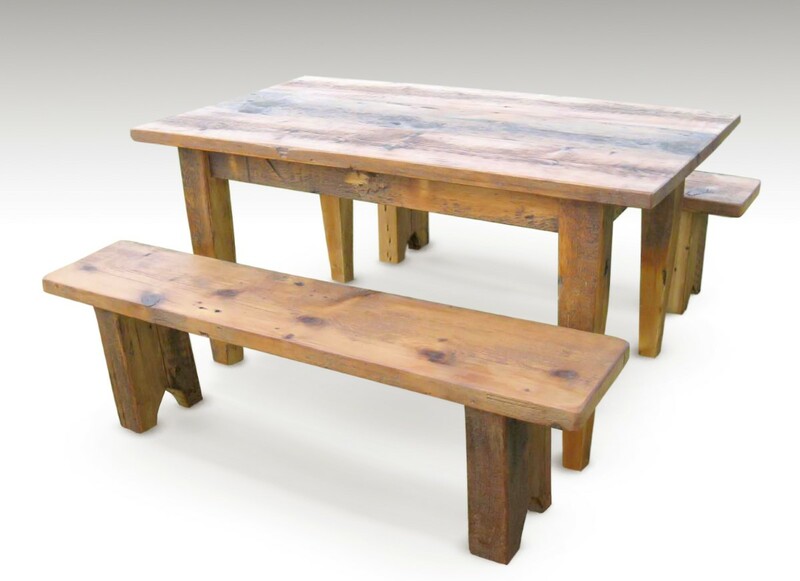 Then contact us at Olde Good Things so we can help you decide on the right design style, color, finish, and size for your custom reclaimed wood dining table. 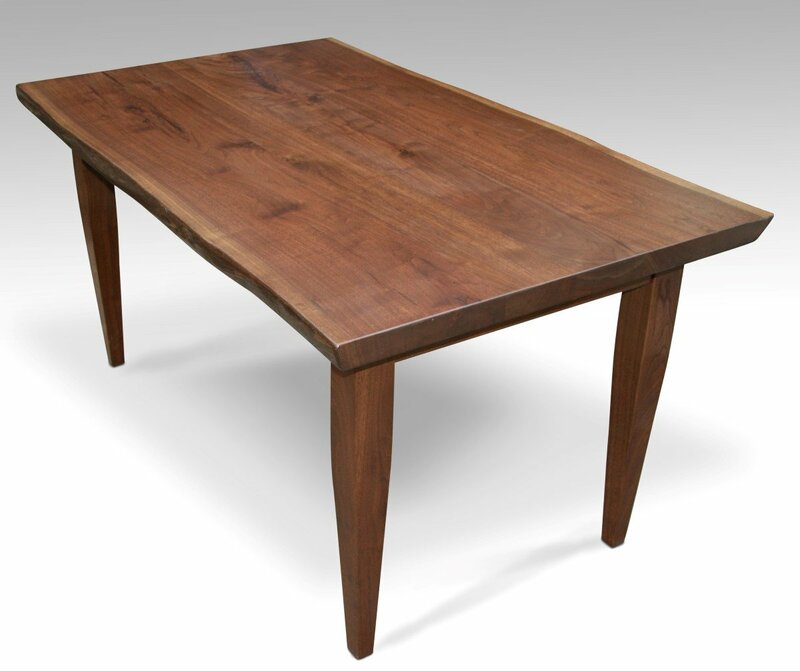 All of our dining room tables are made to custom length, width, and height. Our beautiful wood choices include pine, oak, maple, and walnut. 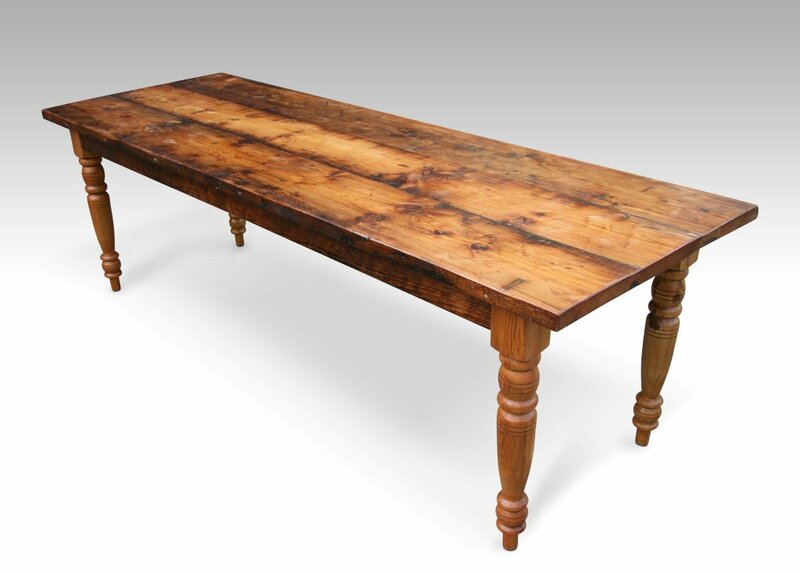 The finish for your dining room table top can be smooth, semi-rustic, or rustic with a stain to suit your color palette. 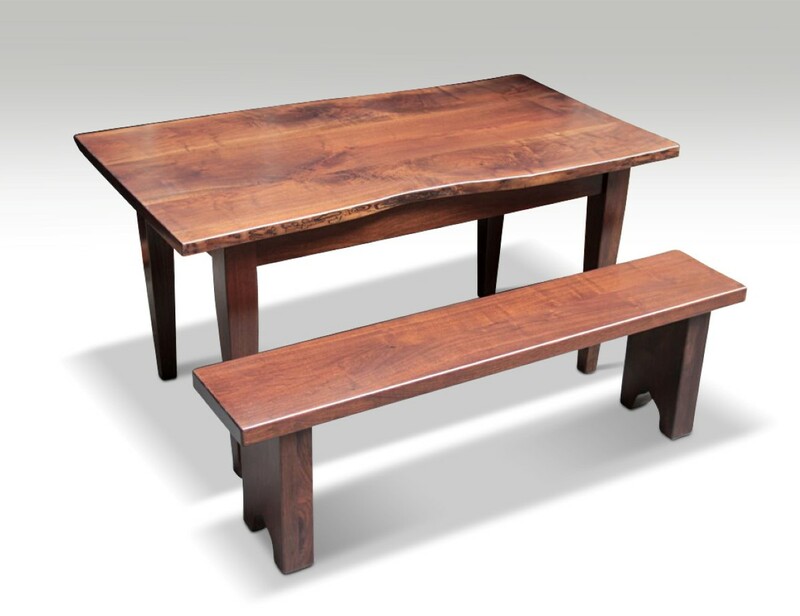 We also offer traditional benches as an addition to each custom dining table. Despite its age, the wood used retains its quality and longevity, and will look and feel better than anything on the market. 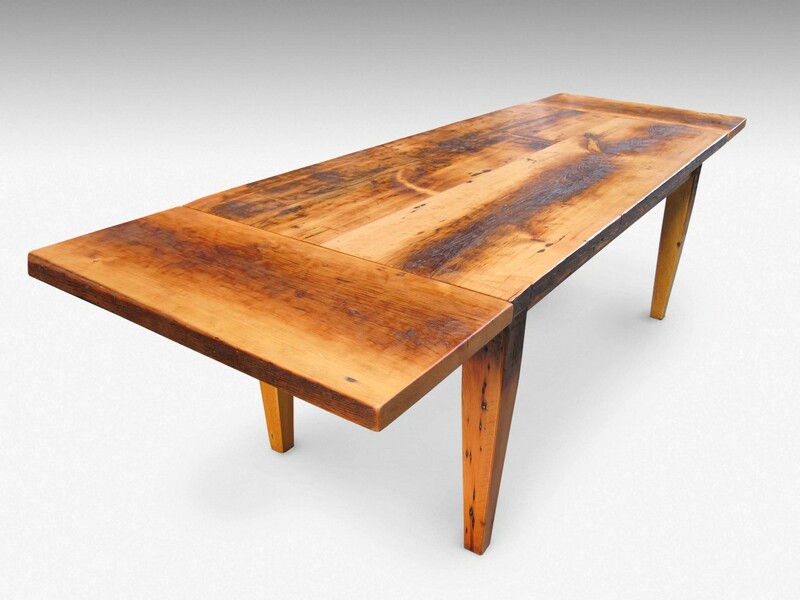 If you are ready to begin designing your custom reclaimed wood dining table, please contact us today. When most people think of tiles, they conjure up images of those horrendously tacky squares of cheap porcelain that crowd the floor of many older homes. 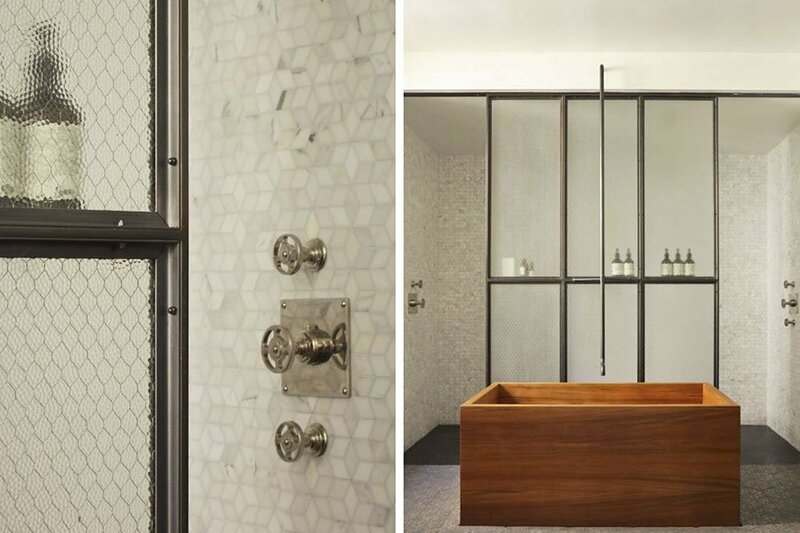 Fortunately, when we talk about tiles we are talking about the classic, beautifully made, and carefully salvaged vintage and antique tile that we’ve had the privilege of adding to our growing inventory. 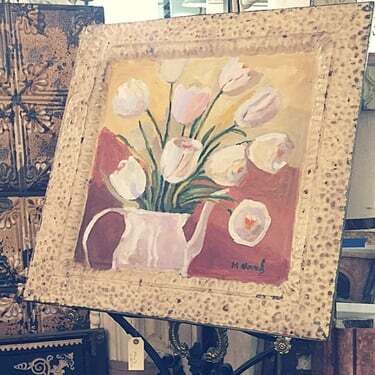 With so many exquisite pieces entering our showroom we are eager to share with our customers a few creative decorating ideas that incorporate vintage and antique tiles. 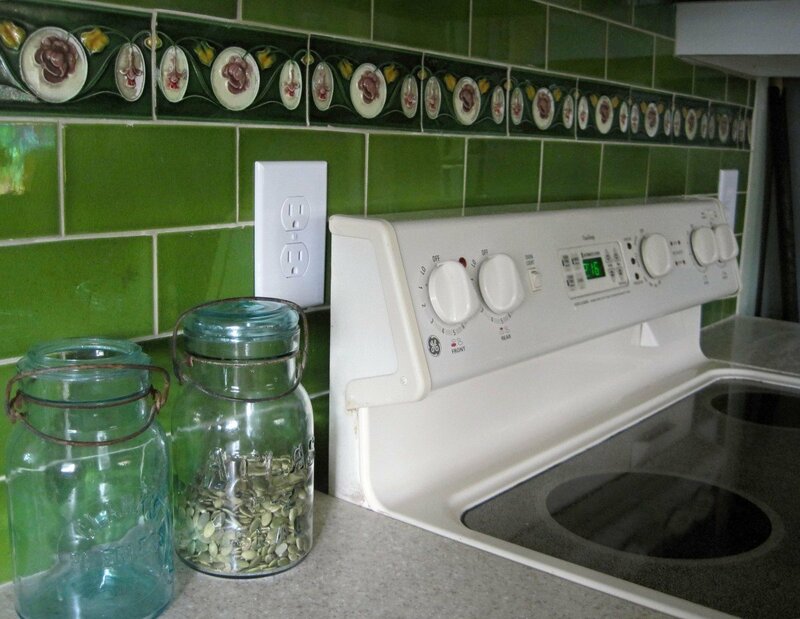 Decorating with tile requires that you have either a friend in construction or a skill at creative repurposing. 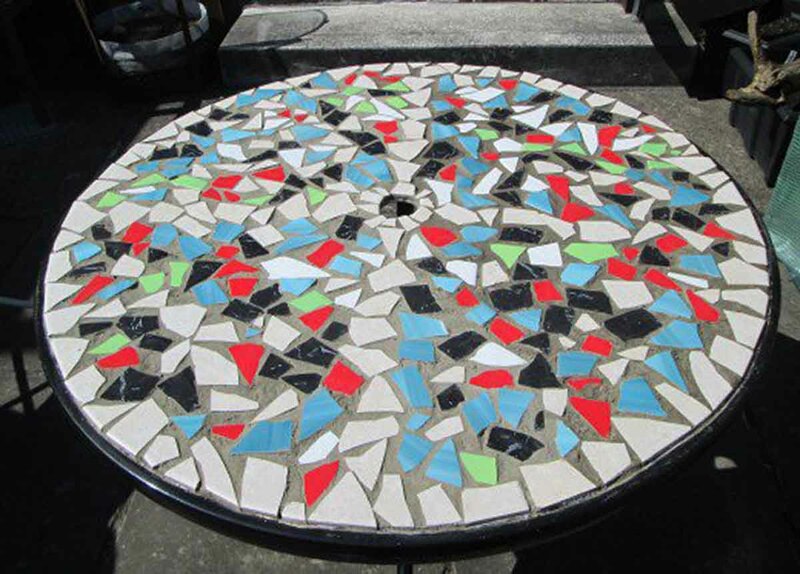 If you want to make a show stopping conversation piece, why not take on old coffee table and decorate the top of the table by making a mosaic of broken salvaged tiles. 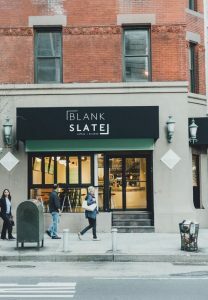 All you need is sandpaper, tiling cement, your choice of color or plain grout, and a selection of hand-picked vintage tile from Olde Good Things. 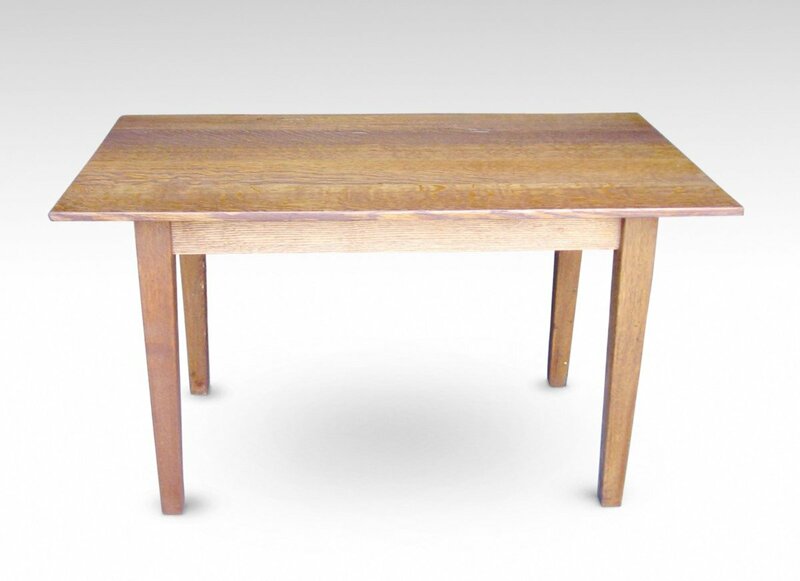 If you don’t have an old coffee table, consider using a side table, or repurposing an old trunk. Get creative and enjoy the process. 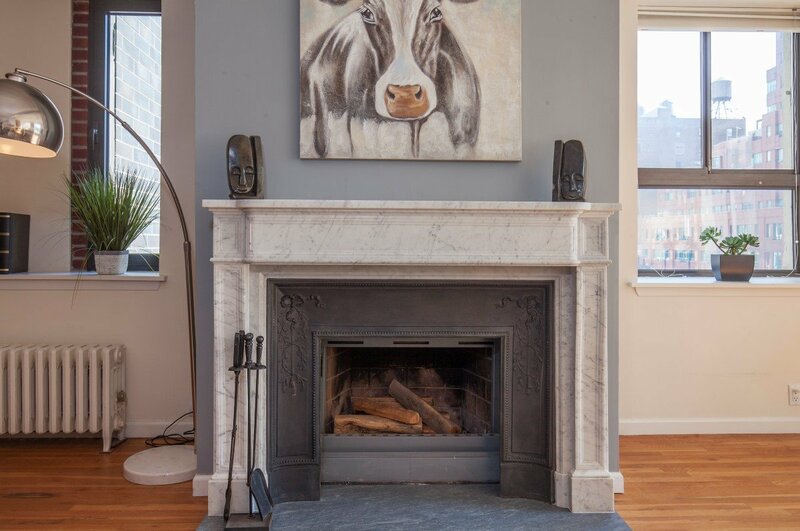 If you’d rather leave your furniture as is, why not reface your old fireplace? Using vintage or antique tiles to add color or drama to your fireplace is a great way to make something old sooty into something “olde good”. The sheer number of remodeling shows on TV can be staggering, but many of them provide our customers with great repurposing ideas. 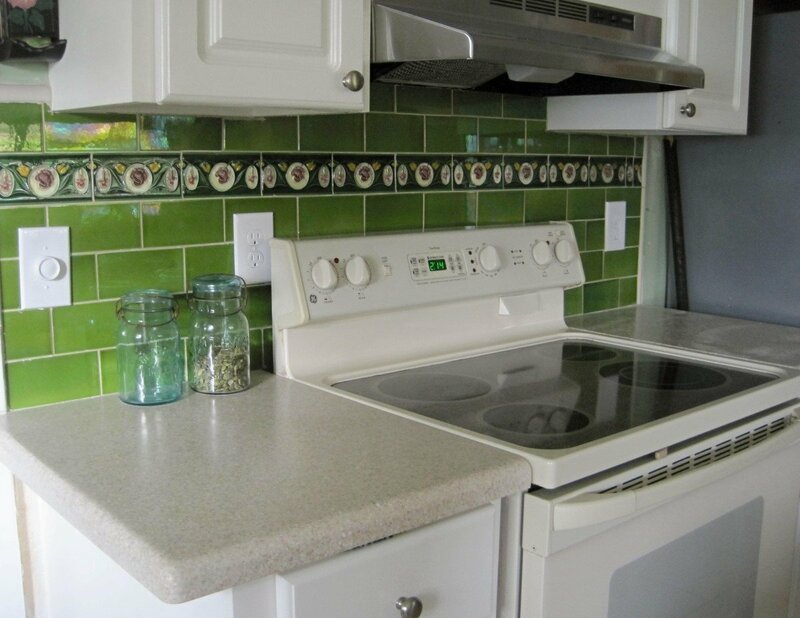 If you’re planning to remodel your kitchen and you want to add flair that cannot be bought at Home Depot you should piece together a backsplash made entirely of salvaged vintage tiles. 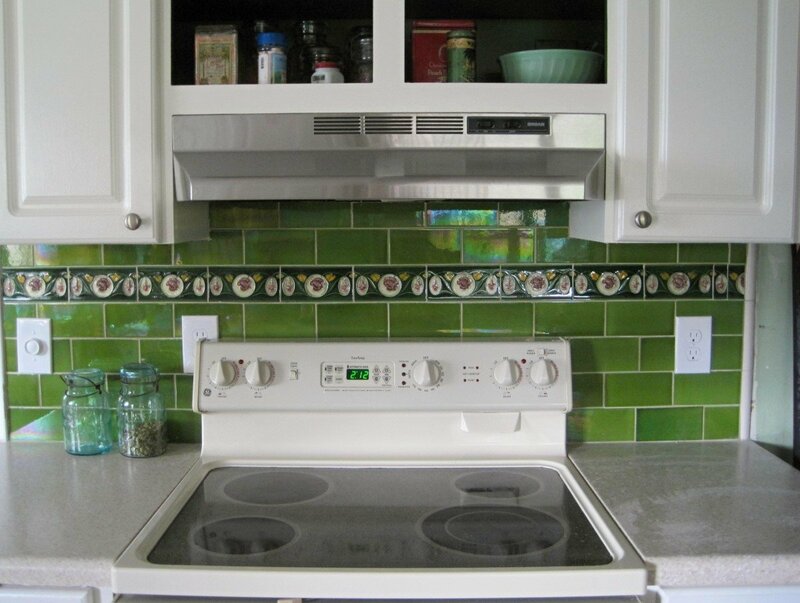 Check out this photo of a backsplash that literally catches the eye and makes the heart smile! Bright, colorful, and fun! 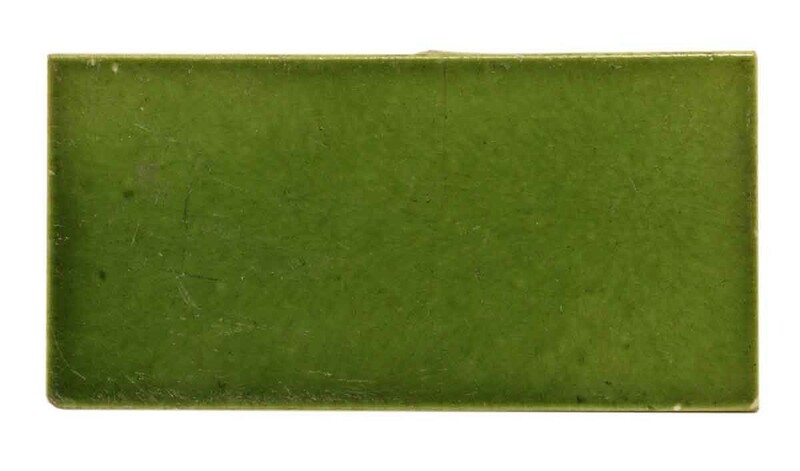 There is still green subway tiles available, view online now! 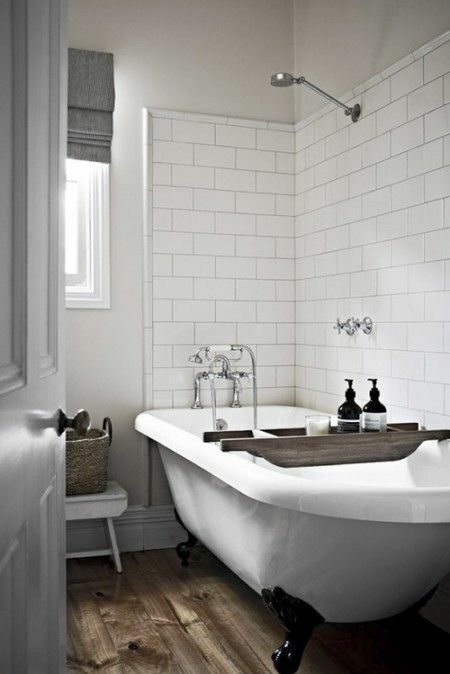 If you’re looking for something that will stand the test of time and make you feel great about your materials choices, you have to call Lowes, cancel that order for bathroom tiles, and tile your bathroom using salvaged subway tiles. When you reuse old tiles you are adding an “eco-friendly” stamp to your project which can actually increase the value of your property. Here is a selection of tile that would be perfect for a bathroom remodel. Olde Good Things is doing its part to make the world a beautiful place, one tile at a time. It’s up to you to check out what we have in stock and let your imagination run wild. 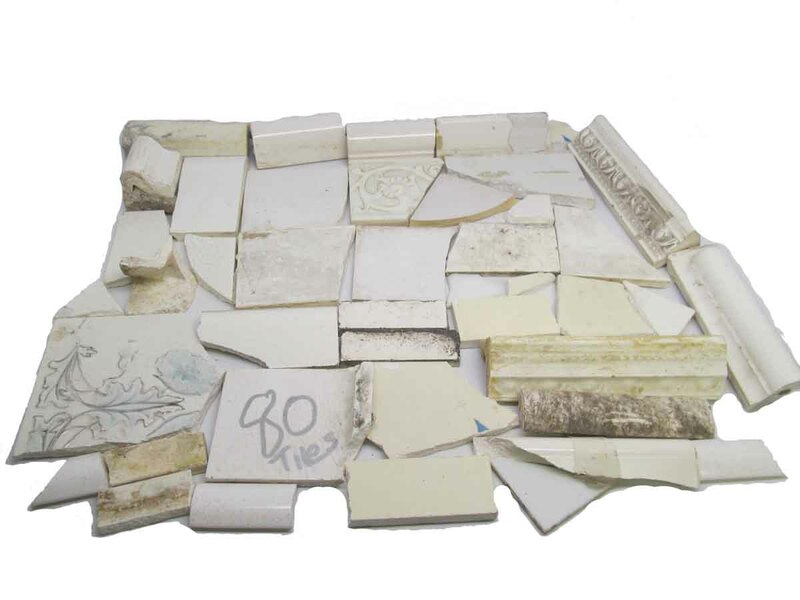 Do you have any creative ideas for reusing vintage and antique tile? Let us know and feel free to share your photos on our Facebook page. The world-famous Plaza Hotel in Manhattan overlooking Central Park is an undisputed architectural beauty. Olde Good Things discovered plenty of architectural wonders inside, as well, when the new owners held a tag sale prior to renovations in 2005. 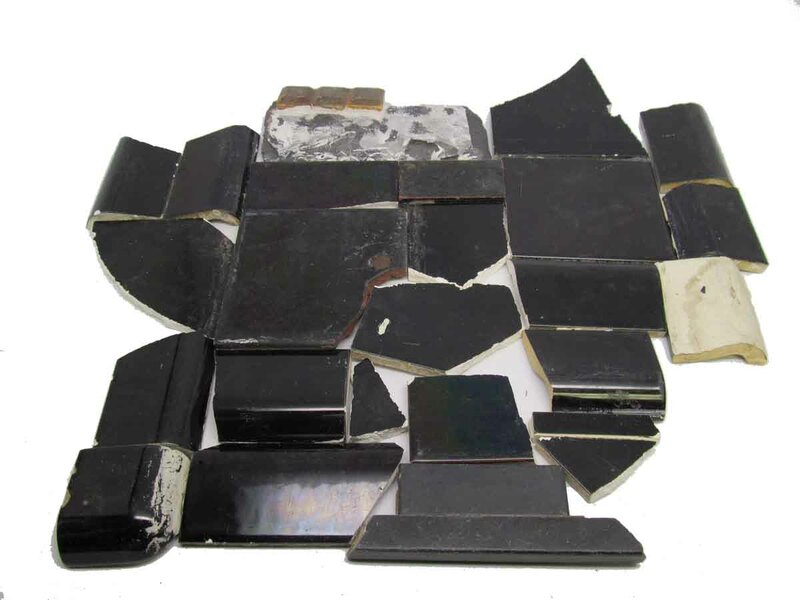 Our scavenging produced, among other things, around 300 reclaimed historic mantels for us to add to our collection. 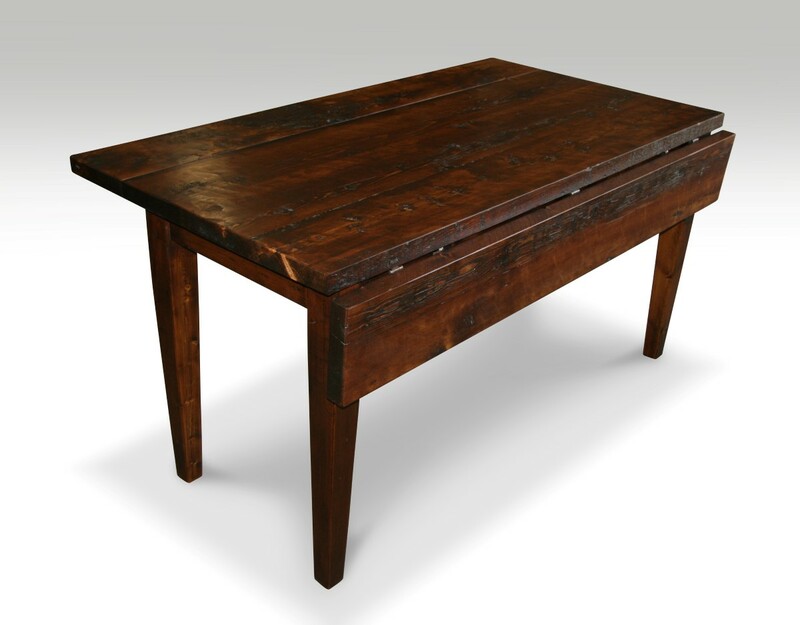 Even more exciting are what our wonderful clients are able to do with our architectural salvage pieces. 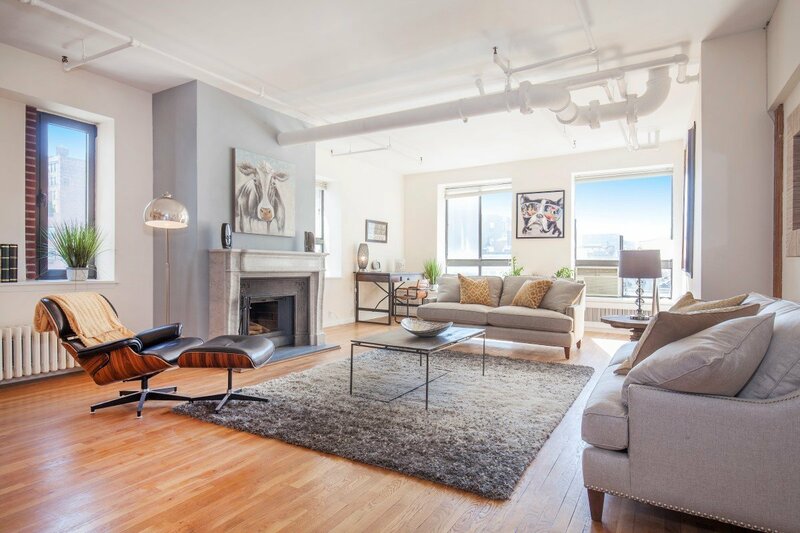 Some of our clients were able to make drastic changes to the atmosphere of their Manhattan loft with the simple addition of a Plaza Hotel mantel. 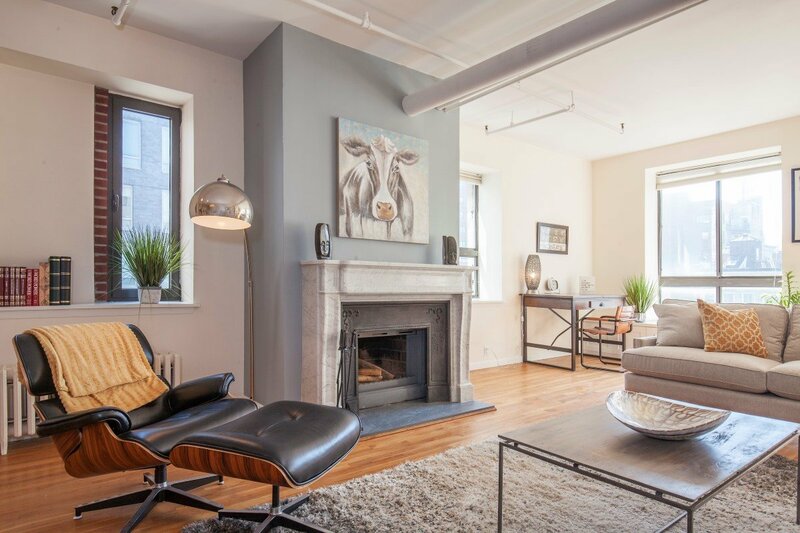 The clients felt that the wood-burning fireplace in their stunning loft was far from living up to its true potential. 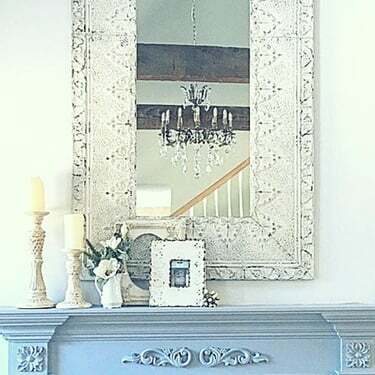 Just look at how this stunning mantelpiece highlights a classic interior! 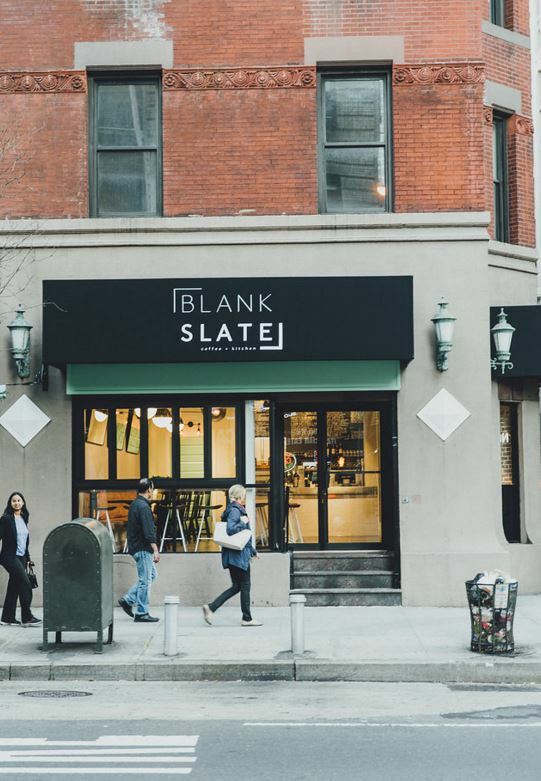 “It should have been the focal point of our living room, but instead it just looked like a dark hole in the wall,” said Han Willem Kotterman, the loft’s owner. The clients began an unfruitful search for a mantelpiece that would change the look and feel of the fireplace and the living area in general. 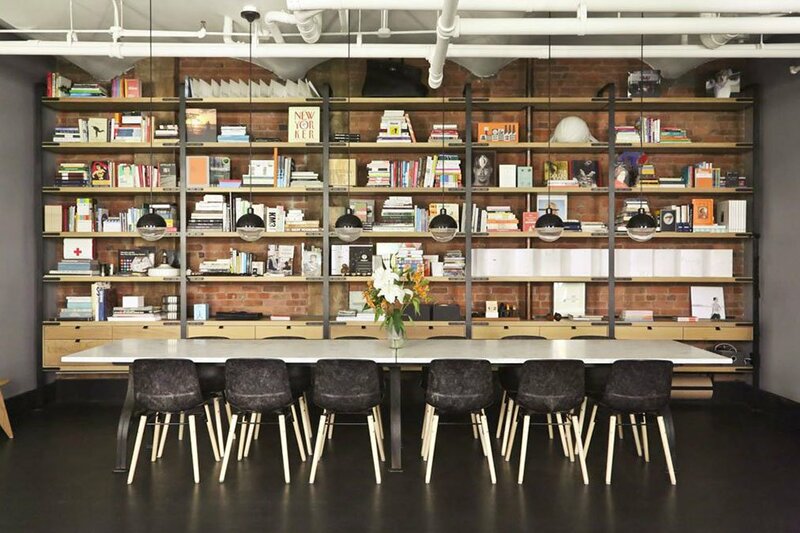 The space demanded a piece with edgy, classic lines that was not subject to ornamentation overkill. With a one-week deadline to find the perfect piece AND install it, the clients were close to giving up. Most items were either not what they wanted or would take too long to arrive. 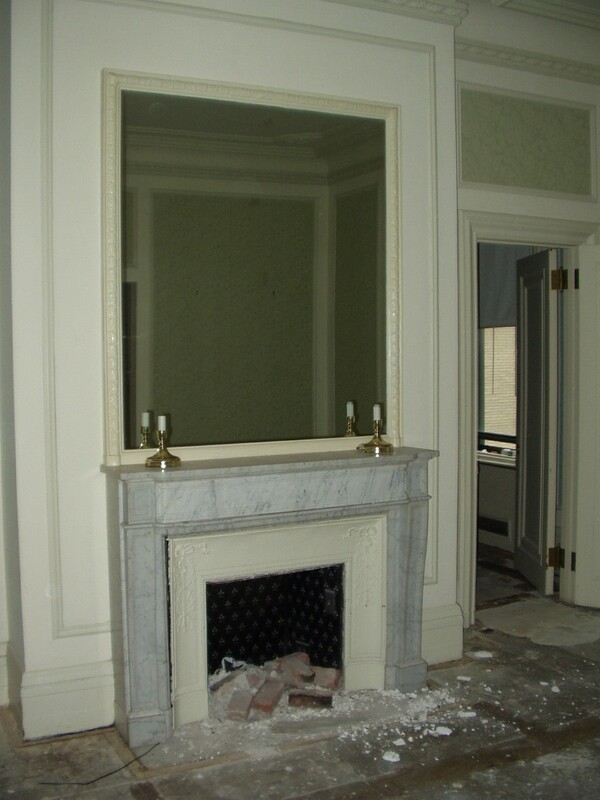 This is when they “stumbled upon” Olde Good Things and an antique marble mantlepiece recovered from the Plaza. Although the mantel was exactly what the clients were looking for, Kotterman was skeptical that the impossible deadline would be met. The mantel was dismantled and delivered within 24 hours with the help of Joe at OGT. 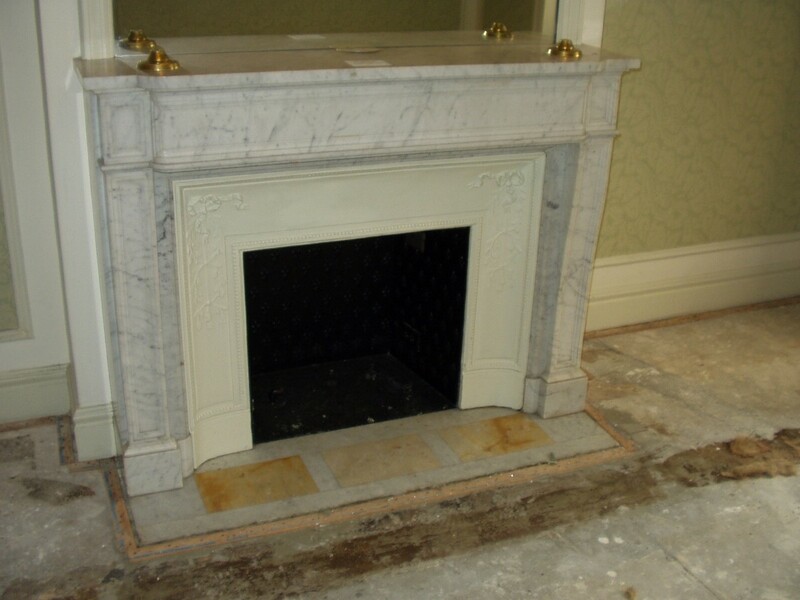 The marble slab need some slight repair, which was done within three days, and the mantel was professionally installed within five. 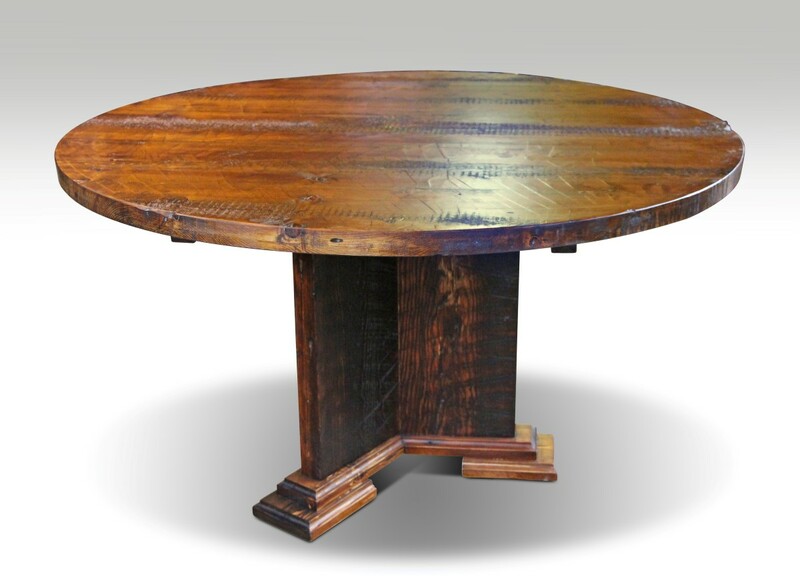 The clients were very pleased with the look of this piece, along with its historical feel. The fireplace is truly comment-worthy, and has a great story behind it. The Plaza, after all. To see what other architectural wonders we have in stock, call Olde Good Things at 1-888-233-9678 or visit one of our locations. We are happy to feature your project in our Customer Showcase. Below view the original salvaged pictures of where this mantel once stood in the extraordinary Plaza Hotel. There are several mantels still left in this particular style. View all the Plaza mantels still in stock. Marilyn Monroe once said, “I don’t want everybody to see exactly where I live, what my sofa or my fireplace looks like. If only she knew about OGT andirons…. She may have changed her mind. As we waltz into this holiday season, OGT brings an incredible selection of statement pieces for your hearth. 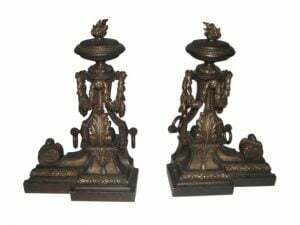 With many people preferring simple, functional log holders, Andirons may not be typical, but isn’t that more reason to pay attention? Renaissance designers, inspired by ancient Greek and Roman statues, casted beautiful figurative pieces, while the 18th century metal workers depicted animals such as horses, griffins and dragons. Metal began to deviate as well, morphing from ferrous wrought iron to brass, bronze, and even precious silver. By the 19th century, andirons were not just a practical addition to the home, but adornment for the centerpiece that the hearth was and always will be. As the temperature drops, we too turn to the fireplace. Online and in-store we present andirons ranging from Gothic to early American designs in brass, bronze and wrought iron. 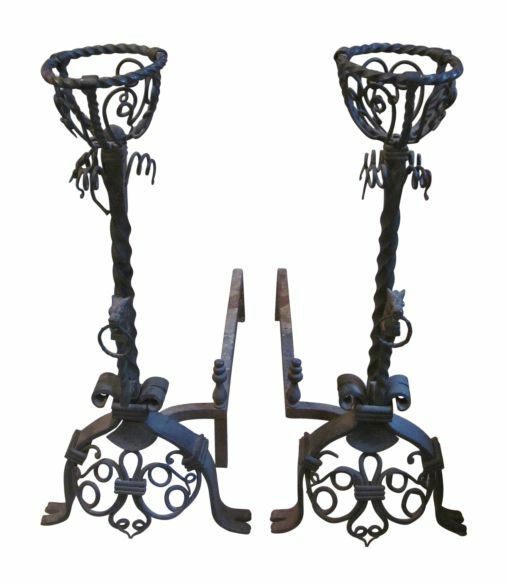 One pair, found at our store in the Bowery, features wrought iron horse heads holding a ring. 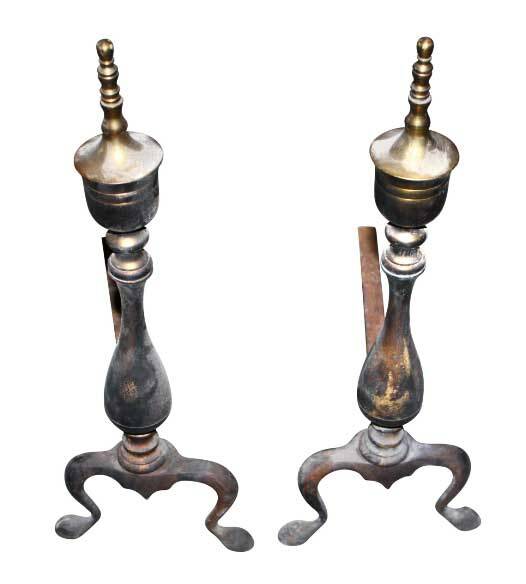 Online, one can find a French pair with flame finials (item number M215442). 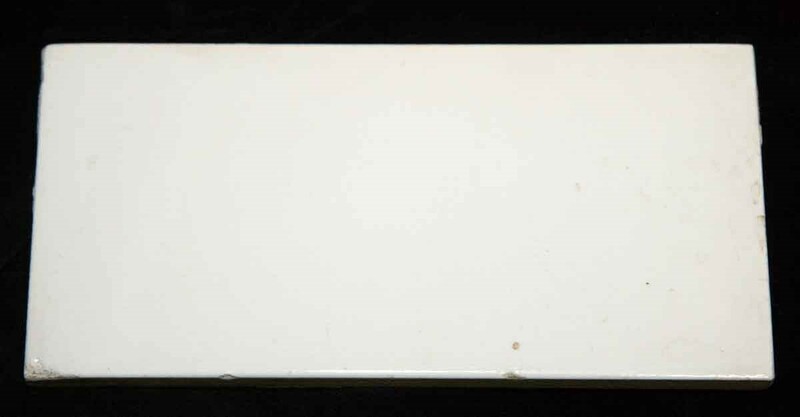 Or even a clean but classic design featured in brass (item number K190674).